356 pages | 37 B/W Illus. Museum Informatics explores the sociotechnical issues that arise when people, information, and technology interact in museums. It is designed specifically to address the many challenges faced by museums, museum professionals, and museum visitors in the information society. It examines not only applications of new technologies in museums, but how advances in information science and technology have changed the very nature of museums, both what it is to work in one, and what it is to visit one. 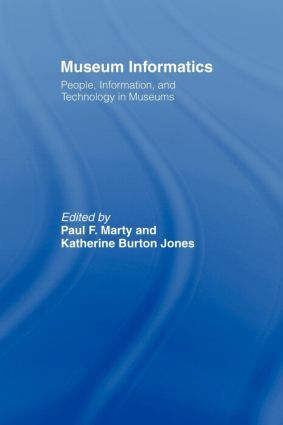 To explore these issues, Museum Informatics offers a selection of contributed chapters, written by leading museum researchers and practitioners, each covering significant themes or concepts fundamental to the study of museum informatics and providing practical examples and detailed case studies useful for museum researchers and professionals. In this way, Museum Informatics offers a fresh perspective on the sociotechnical interactions that occur between people, information, and technology in museums, presented in a format accessible to multiple audiences, including researchers, students, museum professionals, and museum visitors. Paul F. Marty is Assistant Professor in the College of Information at Florida State University. He has a background in ancient history and computer science engineering, and his Ph.D. is from the Graduate School of Library and Information Science at the University of Illinois at Urbana-Champaign. Katherine Burton Jones is the Assistant Dean for Information Technology and Media Services at the Harvard Divinity School. She is the Research Advisor and an instructor for the Masters in Liberal Arts in Museum Studies. She is a former President of the Board of Directors of the Museum Computer Network.